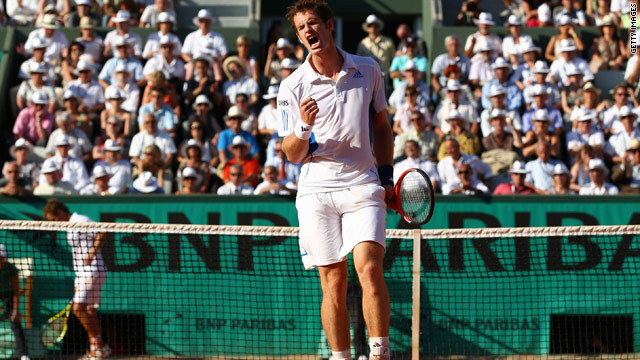 Andy Murray celebrates winning a point on his way to a stunning five-set victory over Richard Gasquet. (CNN) -- Fourth seed Andy Murray is through to the second round of the French Open after a stunning five-set victory over local favorite Richard Gasquet on Monday. In a carbon copy match of their epic fourth round encounter at Wimbledon two years ago, the Briton fought back from two sets to love down to reach the last 64 in a marathon four-hour battle. Murray, who has struggled for form since reaching the Australian Open final at the start of the year, looked to be heading out of the tournament as Gasquet forged into a two-set lead. But just like their SW19 meeting in 2008, Murray battled back to progress 4-6 6-7 6-4 6-2 6-1. Blog: Should French Open leave Roland Garros? Gasquet had slipped to 68th in the world after suffering from a succession of injuries, and also a suspension for failing a drugs test. However, he won his first ATP Tour title for three years in Nice last weekend and, backed by a partisan home crowd, he looked set for a famous win until Murray showed the battling qualities that have seen him win seven of his last eight five-set matches. "It's always hard in a Grand Slam, especially against Murray," Gasquet told reporters. "He's always fighting, putting all the balls in the court, running well. I was close but it was really hard for me to finish the match." Meanwhile, there were no such problems for top seed and defending champion Roger Federer, who cruised into the second round in straight sets. The Swiss began his campaign for a 17th major with a comfortable 6-4 6-1 6-2 win over Australia's Peter Luczak and will now face Colombia's Alejandro Falla. Third seed Novak Djokovic is also through but the Serb, who has been suffering from a virus in recent weeks, looked far from his best in a 6-1 3-6 6-1 6-3 victory over Kazakhstan's Evgeny Korolev. Fernando Gonzalez (12) and Gael Monfils (13) both went through in four sets while 19th seed Nicolas Almagro was taken to five sets by Dutchman Robin Haase. Two Spanish seeds did crash out though. Tommy Rodrebo (21) -- who has reached the Roland Garros last eight four times -- crashed 6-4 6-4 6-3 to Serb Viktor Troicki. And 27th seed Feliciano Lopez was beaten 6-1 7-6 6-2 by German qualifier Julian Reister, the world number 165.